Every year our wovens designers take to Paris, elbowing through the masses of likeminded creators entering the fabric mecca of Première Vision. The only tradeshow of its kind, Première Vision houses 740 of the top fabric mills from over 28 countries. Navigating the landscape – discovering plush new textures, refreshingly original patterns, and intriguing new weaving techniques – excited gasps can be heard in every language imaginable. It’s on this hallowed ground that inspiration, which pumps the heartbeat of our brand, is found. 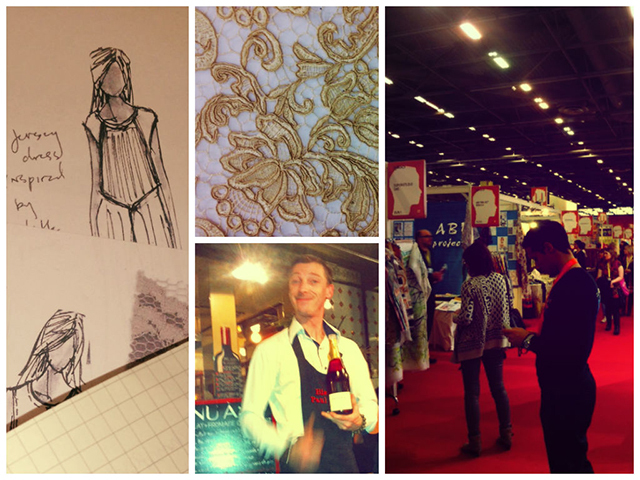 Gathering inspiration at Premiere Vision: design sketches, antique lace, the convention hall, and a much needed glass of wine! With this new spark of almost-divine inspiration filling their bodies and sending their brains into a flurry of fashion to come, our team heads back to Canaan Farm. Collaborating with knitwear designers, the wovens designers add their inspiration to the the ever-important seasonal mood boards. These Mood Boards, telling a season’s story, are creatively cluttered with swatches, tear sheets and photos. Bits and pieces of haberdashery from travels to far-off lands adorn the board’s terrain, accompanied by statuesque croquis dressed in quickly sketched silhouettes. Almost magically, the mood board takes on a life of its own. As yarn dyes are added, swatches subtracted, sketches scrapped then pasted back again, the mood organically morphs from its initial intended state, to almost perfect, and finally growing into “I think we’ve got it”. It’s this process of clever collaboration between our Wovens and Knits design teams that fuels the fashions for the season. Feeling, touching and inhaling new ideas, new creativity, and new concepts, shapes the collections of seasons to come at Peruvian Connection. We know that if your eyes are eager and your thoughts are clear and open, inspiration can be found everywhere you look. The smallest, most easily overlooked object can provoke genius, an off-the-cuff comment can cultivate exquisiteness – but it never hurt anyone’s creative flow to visit Première Vision.